By PaleWolf Brunelle, #2495L, February 16, 2018 in SASS Wire F.A.Q. Good. It never made sense trying to regulate or differentiate the depth or amount of "wear" on these finger groove grips. I agree with Larsen in regards to regulating the grip depth just doesn’t make sense. I disagree that the finger groove grips shouldn’t be allowed, however. Seeing how these grips were used by the most iconic western figure of all time makes disallowing them a serious head scratcher. There is already precedent in allowing specific John Wayne big loop levers, with the rule stating only that modification and no other. And yet we didn’t see a whole slew of modifications trying to skirt that rule. Instead we allow bizarre modifications that never existed such as army grips on an SAA, ruger bisleys that atent even remotely like original, octagon barrel single actions, and let’s not forget short stroke kits and the ruger old army that also never existed. I think fearing that people will take advantage and start tossing on all kinds of target grips to bra red herring at best. A simple rule stating “only three finger grooves on one grip panel” would work just as well as the big loop exception currently does. A big loop lever is a competitive disadvantage. Grip enhancements on a revolver are a benefit. Not the same thing. So the spirit of cowboy action shooting, which is emulating the old west and the movie heroes of Hollywood westerns, only applies as long as there are no competitive advantages? How about all the competitive advantages that already exist currently that have nothing at all to do with the real west or the reel west? It seems you are cherry picking your arguments here. No. No. No. Not a competitive advantage. They just make the guns more comfortable and enjoyable to shoot. Like the short stroke rifles. "Finger-grooved" grips were already NOT LEGAL under the "Firearm Covenants" except for ONE specific version of a single model of firearm. More recent versions of that model revolver and the aftermarket replacement grips in that style have significantly deeper grooves; which had already been ruled as ILLEGAL for SASS-rules competition under the existing external modification regulations. The OP is strictly informational regarding a decision by the Range Operations Committee regarding the reversal of the approval for the initial offering. For what it’s worth, I’m the one that sent the application. Upon researching whether the grips were legal or not and why only one set were legal, I cane across two distinct explanations. 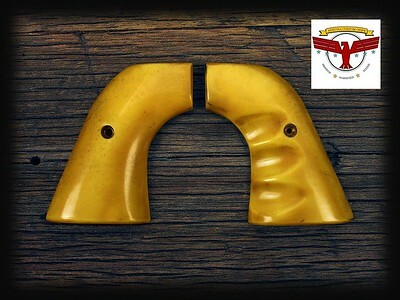 The first was that the original cimarron rooster shooter grips with the shallower grooves were alllowed because they were the only make of these types of grips that bothered to ask for a ruling. Later they changed their grips to deeper grooves similar to the aftermarket makers, just as the pictures Pale Wolf show. The reason given for them to no longer be legal was because the original version was a more realistic copy of the ones John Wayne used. Or so the ROC thought. The reason I submitted the application is first because no one bothered to ask about the deeper grooves and secondly because the ROC had been misinformed as to what John Wayne’s grips actually looked like. Below is a picture of his real gun. As you can see, the later rooster shooter and after market versions mimic the real life grips much accurately than the original version. No biggie. Just pointing out that any competitive advantage that short stroked rifles may have offered was downplayed by people saying it was primarily to make them more comfortable and enjoyable to shoot. The initial approval of the earlier version of the "Rooster Shooter" was based on the fact that the grips had very faint grooves (as provided by Bar-S/Tru-Ivory); shown in the photo of the RS410. ROC members who examined them "on site"/"in hand" made a determination that they would provide very little or no "competitive advantage". NOT because they were accurate copies of JW's original (which would have been in violation of the SASS rules cited in the OP). Thanks PW. Can you clarify if I’ve got the process correct? Someone applies for a ruling on equipment. The ROC determines if there is a competitive advantage. If it is determined that there is no competitive advantage the ROC can then decide to approve or not. If the ROC determines that there is a competitive advantage then it is out of their hands and must be voted on by the TGs. Do I have that correct? Despite shortstroke rifles being fun and easy to shoot fast, I for one wish that door had never been opened. And then it happened again with pistols. Now that we know that formerly approved things can become unapproved, can I start a petition to have shortstroke pistols banned??? Haha, don't shoot me! "Competitive advantage" is only one of the considerations in reviewing an application for modification/ equipment approval. That was a factor in the original ruling, as well as the opinion that those grips did NOT "...constitute any kind of radical or target type grip enhancement." If an item/mod is found to be specifically forbidden under the current rules, "legalizing" it would require an actual rule change; which falls under the jurisdiction of the Territorial Governors as a voting group. The ROC determined that the much deeper finger grooves on the newer version of the "Rooster Shooter", as well as the after market replacement grips, fall under the rules cited in the OP that disallow them. I also seem to recall people saying that original winchesters had a shorter stroke than Ubertis (not that too many top shooter gamers use originals )! I got to thinking (dangerous I know) so how does something like this get voted on now that the ROC has ruled? And also, what happens to those folks that are currently using the once legal version? Are they allowed a grace period or does it go into effect immediately? Are we kidding? 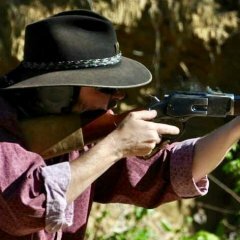 Short stroking lever actions are way more competitive and what about gunfighter grips with the special checkering. Seems to me that we pick and choose based on who sponsors what! We have "Evil Roy" model pistols that are very competitive, and Cimarron has their Rooster model with the custom finger grips that are the only ones approved? What if a cowpoke whittled finger groves into his grips, like notches, those aren't approved? Guess if you put in enough money or have the most competitive shooters want something it's ok! Don't seem fair to me but then I have never worried about competing! Hey Redwood, go ahead and get the grips and don't worry about competing! I remembered when the winners weren't suppose to have sponsors either but now they can have schools and firearm models with their name on them, can't tell me they ain't getting a royalty, buts that's ok and letting other SASS members not have grips unless the buy the whole gun from Cimmarron is as well. Oh for the days when you could come and shoot and not worry about all the mods on other people's guns and just have a good time shooting what you brought! You cynicism makes me sad. Did you read the OP? The Cimarron Rooster Shooters are no longer allowed. That approval was rescinded. Your telling Redwood to go ahead and get them is reckless and advocates that breaking the rules is okay and will not have adverse consequences. About the allowed external modifications, I know that the ROC agonizes over every one and I respect their attempts to make the game true to its roots by limiting external modifications. However, folks have said that short strokes make the guns more fun to shoot. My experiences are as follow. I shot a short-stroked '73 and didn't ;like it. I shot a short-stroked Ruger and loved it. To each his own. I try to not rain on someone's parade who is following the rules. Your post implies that some of our rules are based on profit. Well, I sincerely doubt that decision makers (WB, ROCs, TGs) receive any compensation for their decisions. I have been a TG for 13 years and have never received a gun from a sponsor. BTW, your statement of "can't tell me they ain't getting a royalty" has no facts to back it up. As such it is pretty accusatory. In fact SASS rules specifically state that there should be no prizes for performance. The following is from the Match Administration Handbook. "The recommendations are simple: prizes are awarded by some form of random drawing. Competitors are rewarded for participating, not how well they shoot. It is recommended the winners be given no more than a plaque or trophy – this is the best way to ensure COWBOY ACTION SHOOTING ™ remains a fun, amateur sport for the whole family." Also, I do not understand how a shooter's selling a product or service on their own (as a Merchant) has anything to do with our official rules for the game. About your last sentence, "Oh for the days when you could come and shoot and not worry about all the mods on other people's guns and just have a good time shooting what you brought! " Maybe you need to pay less attention to what everyone else is doing as long as they are within the rules. If you are mad because you aren't placing higher, maybe you should practice more. I did not say for someone to compete with unauthorized equipment, I said to use unauthorized equipment and shoot and not to or not worrying about competing! I don't care what modifications are out there, but appears that only certain mods are approved and all have been competitive. And no one can convince me that there isn't some form of compensation for endorsements used in advertisements or royalties paid for the use of a name in a gun model sold. I cannot understand how much more competitive finger grips would be then gunfighter grips, why one and not the other? I have never shot to compete, nor have I cared what other people shot modified or not. Like Redwood I like dressing up like the Duke using his style of clothing leather and firearms. What is the harm if I buy the grips for one of the two of my pistols and shoot? And if the grip isn't sanctioned and I can't win anything but still shoot what is the problem with that? Nothing as far as I can see except I will have a bigger smile on my face because I am that much closer to shooting and looking like John Wayne! That's while I joined 24 years ago, not for trophies but commraderie and volunteering in the club. So when I question why someone else can't have a new modification I believe I am entitled to my opinion, I think I paid for it! The first stage you do that on will earn you a SDQ. The second stage is another SDQ. Two SDQs equal a MDQ and you are done shooting for the match. Hey Nimble. While you and I agree on the competitive nature of the grips, as well as other mods, I believe what is happening here with the ROC decision is less about whether they [ROC] feel the grips are competitive or not and more about applying them to the written rules. I could be wrong, but that is the gist I am getting from Pale Wolf. Since the ROC has ruled that the grips fall into the area of target grips (which is a point that I still disagree with) and target grips are specifically disallowed per the rules, the ROC is making the determination that the use of them would violate that specific rule. I feel like the ROC is the supreme court interpreting the written rules rather than writing new rules, whereas the TG is congress that actually writes and votes on the rules. So the next steps would be to get the TG's to somehow vote to allow these specific style of grips, just as they have allowed a specific style of lever loop. I am just not certain on how that process happens. So the next steps would be to get the TG's to somehow vote to allow these specific style of grips, just as they have allowed a specific style of lever loop. I am just not certain on how that process happens. I would suggest you review our PM discussion regarding initiating the process (and the likelihood that this issue would never make it to the TGs for a vote). That would be an actual rule change requiring approval by a 2/3 majority of the Territorial Governors; provided that the WB/ROC felt it in the best interests of SASS to allow "target-type" grip enhancements for revolvers...which would open the door to various other styles (note what happened regarding approval of the Ruger Montado/SBHK hammers). I really don't see that happening, but you could see if your TG might be interested in posing it as a "discussion item" at the next general assembly (perhaps at WR). Thanks, Pale Wolf. I couldn't find it in my PM's. I do remember the vote part (though in my head I thought is was a simple majority needed), but I couldn't remember what it took to get it to the vote. So just ask my TG to bring it up? Too late I believe for Winter Range, but I'll ask all of them (I shoot at 4 clubs regularly) and see if any will bring it up. Thanks. Ok you are definitely correct at end of trail Allie and perhaps at a regional match as well but at my club's monthly matches that would not be the case as they let people shoot and worry about the competitive nature later. And I would go so far as to say that I could at the annual shoot they put on this month. So for someone like me who enjoys the shooting and not the politics you are wrong and I can still shoot. Hey I wonder if I should call Cimmarron and now see if they will sell me a set of the grips as it appears according to Allie no one can use those Rooster pistols in a SASS match? I am thinking they will take those Rooster grips off and replace them so people will buy the pistols! I may get my Duke grips for my Colt anyway! FYI, The Gold Coast Gunslingers are listed among SASS-affiliated clubs. It is my understanding that they follow SASS rules. This has nothing to do with club politics and everything to do with playing by the rules. If you think I am wrong, why don't you have one of the club officers come here and state that you can use whatever grips you want to use at either their monthly or annual matches.. Some clubs will accommodate new (for a short time) or disabled shooters. By your SASS number, it seems that you likely started in 1999. So you would not need an accommodation. Your willingness to flaunt SASS rules is unbecoming. 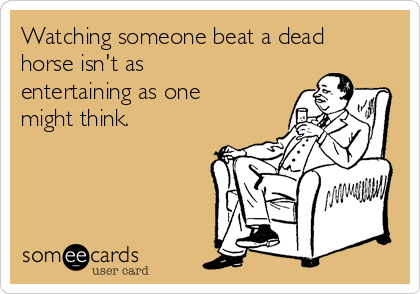 To me it is akin to being a guest in someone's house and criticizing their decorating. Actually it's not according to Allie, it's according to the ROC as mentioned in the OP. I don't believe that Allie is wrong. As she pointed out your club is SASS affiliated and if they're enforcing SASS rules then they shouldn't be allowing you to use those grips in a match. As far as I know SASS does not currently have a category for shooters who want to ignore equipment rules because they're not trying to be competitive. If there is such a category or exception it would be kind of you to point it out. Or are you saying you're entitled to follow only the rules that make sense to you? No I am saying that I can shoot at a match and not have it count! Not be in the competition. If the club allows, as they have in the past non SASS members. It is a monthly match that means nothing to any one else other than the club members. There is no tally that is reported to SASS headquarters, no record of the number of stages or of the hits misses and DNFs. So if I shoot and don't give a hoot about what I shoot as long as everyone is safe, it doesn't matter if I shoot with the grips does it? As I said earlier the was a guy watching the loading table that told both my son and I that we couldn't shoot Winchester rifles with rebounding hammers in a regional shoot, true? Of course not, but if it was then we shouldn't be able to shoot at the monthly matches. If you all are telling me that all the clubs at their monthly shoots are only allowing SASS members to shoot then I have some swamp land in FL to sell you. Look all I am saying to all of you is that if you don't want to compete you don't have too and if that means you have a special gun or equipment that doesn't put the other shooters in danger when fired then you can use it! It was more important at my club to welcome people and make exceptions if necessary so they could shoot and enjoy the game! And I am thinking that if Redwood went to a shoot and had the grips on one of his pistols so he would look more like John Wayne his club would allow him to shoot as long as his scores didn't matter or maybe in his club they wouldn't care! Lets agree to disagree, I think all this stuff is nonsense anyway as Jimmy Stewart didn't short stroke his 73, John Wayne twirled his 92, Bat Masterson and Wyatt Earp didn't hold the trigger down with the finger of one gand and thumb the hammer of their pistol with the other hand. Do and use whatever makes you happy as long as it is safe. But don't hate me for believing that finger grips are more competitive than short stroking, the 2 shell mod, the Ruger pawl or gunfighter grips, cuz I ain't buying it. I am for inclusion not prohibition! Create a new category or allow in a B Western category. This was supposed to be a fun game along time ago and it was then. Now it appears it's who you know to get another enhancement approved when it will make little difference in the game. If it is competitive then all the competitive shooters will use them. How many of you have short stroked your rifles. How many have added the pawl system in their Rutgers? How many have sent their 97s to someone for the 2 shot mod? I will bet all of you that the majority of us who shoot to participate and not compete our number all of the ones who have made them and not a one is begrudging any one those adjustments. We don't care! So let someone else have theirs too! Now I am done!! It's a dead horse anyway as you can't fight the club right guys? I've bolded a couple of things you said. Yes, in answer to the first question, it does matter. There are rules, and whether YOU personally don't give a hoot has no bearing on whether those rules exist or not. Neither you nor any other shooter at a SASS match it entitled to ignore rules you don't like. That seems pretty self evident to me. Perhaps you can point to a rule that shows I'm incorrect, or is this once again YOU creating a special set of rules that apply for YOU? With respect to your bolded statement "that means you have a special gun or equipment that doesn't put the other shooters in danger when fired then you can use it! Where in SASS rules does this statement reside? Is this an organization with rules for our competitions, or is this a bunch of people who occasionally get together and fire whatever guns they brought into the berm? I can certainly understand objecting to rule changes and trying to institute rules you believe should exist. I can't get behind the idea that because a shooter doesn't agree with a rule they can just ignore it and the rest of us should be OK with that. If you shot using those grips at a match where I was running the timer you would be penalized for sure. I might not like the rule, I might think it was silly, but even if I did I would enforce it. No offense, but I don't really understand your argument other than being based in the belief you can do whatever you want and the rules don't apply to you unless YOU want them to. I'm not trying to be argumentative, Allie, but we both know local clubs can allow or adjust rules as they see fit. Sometimes for safety reasons, like Richmond not allowing shotgun shells to be on a carrier while moving due to the gravel surface. Other times to allow fun non-sanctioned categories. Outlaw, Josey Wales, Pale Rider, etc. Weren't you saying you shoot "mild bunch" which I don't believe is sanctioned. I could be wrong on that. But we both know it happens. 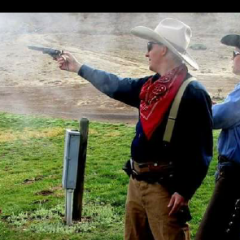 If my local club lets me shoot in my unofficial category, true grit (FCGF meets Classic Cowboy, with bonuses for pre-1899 or John Wayne guns), are they being any different? Shooting different categories has a long history in SASS. It is a means of testing the waters to see if a category has enough proponents to make it viable as an in-the-book category. Case in point FCGF. Also, range rules for safety reasons are widely recognized. I take exception to your implication that you can do as you please in regard to the rules at an annual match at a SASS-affiliated club. I am getting tired of replying to "red herrings." Don't worry, I won't be shooting it at the State match coming up. Let's catch up when I get there. It's been awhile. ok one last time. Don't know where the "bold" statement comment came from. 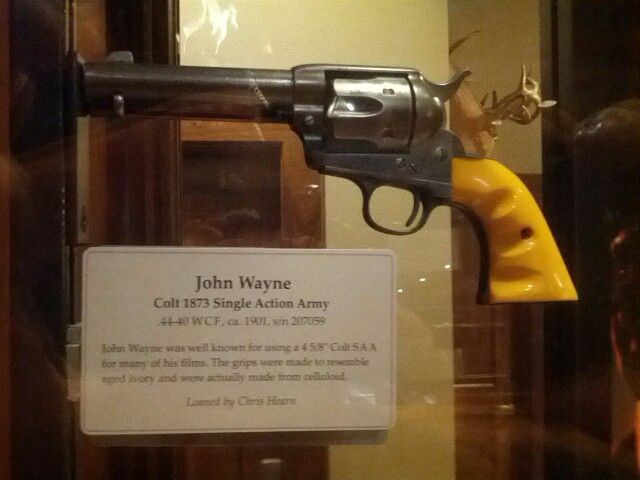 My my point is that I don't see how finger grips that are similar to the guns used by John Wayne are any more competitive than the existing modifications so let in the game! point 2 - I never said annual regional or any other SASS tournament, I said my local clubs' monthly shoot where it doesn't matter what position you finish and at that shoot you can participate (shoot) without your score meaning anything placement wise in the results at the end of the day, is that clear? would never suggest or deviate at a regional or national SASS tournament as I wouldn't go! I am not good enough to compete with all those competitive shooters and I wouldn't have fun! I may go as a visitor if I could go healed, but if not no reason to go, have more fun visiting AZ! 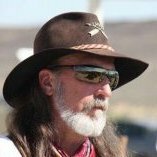 i joined this game to have fun, shoot with a big loop Winchester and with a Colt Buntlines sometimes and when I go to my little club here in S FL I do, because I walk around dressed like John Wayne and don't give a damn about my score! As you said Allie if I were concerned about my score I would practice, but I am not so I have fun volunteer with club tasks, and help others if they ask me. If that is not what our game is about then I am glad I am on the other coast where it is just as sunny and having a good time. So no sedition from the rules, what the hell approve finger grips cuz it won't mean a damn anyway, too few will use them, and finally play the game to have fun it what you shoot and in what you dress as, but always be safe! ist that clear to everyone and you Allie?